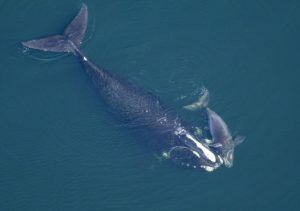 In this Feb. 2009 photo provided by the New England Aquarium, a North Atlantic right whale swims with her calf in the Atlantic Ocean off the coast of the United States near the border between Florida and Georgia. Shooting air guns into the ocean could soon be fair game in the search for oil and gas along the North Carolina coast, even if the seismic blasts “harass marine mammals” such as whales. The National Marine Fisheries Service is considering allowing the practice by energy companies and wants the public to weigh in. “Seismic blasting” is a controversial technique using air guns to explore and map offshore oil and gas reserves deep beneath the ocean floor. They are towed behind ships, shooting loud blasts of compressed air deep into the seabed. These blasts can be repeated every 10 seconds for days to weeks at a time.